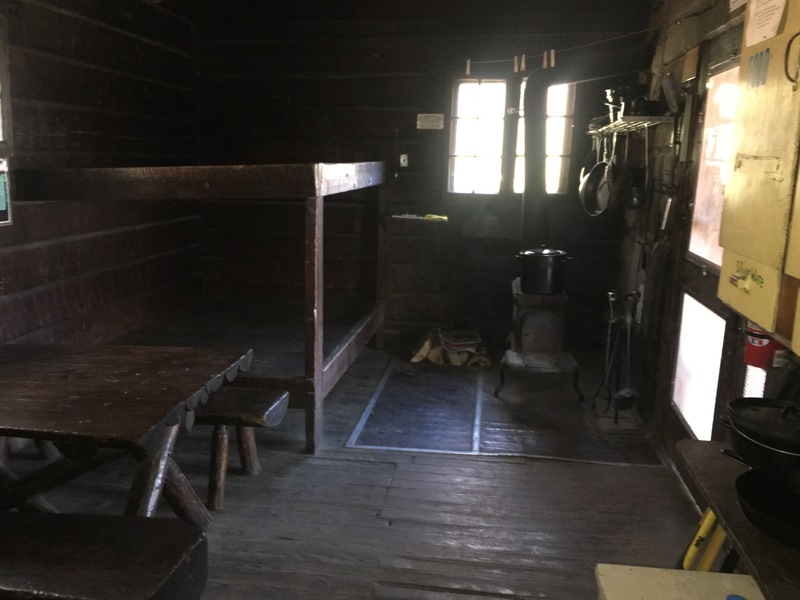 Back in January we walked the short Pocosin Mission Trail, and decided we wanted to come back and stay at the Pocosin Cabin once the weather turned nicer. 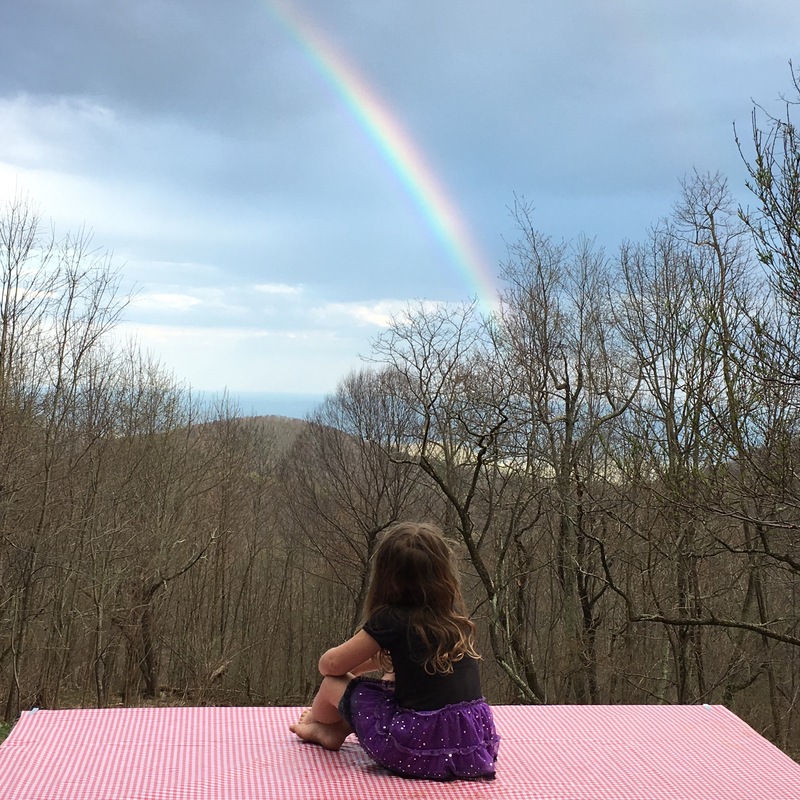 Since Sebastian’s birthday is mid-April, that’s a perfect time to start the camping season, so we booked it, and headed up a few Sundays ago. This was our first time in any of the PATC cabins, so we didn’t really know what to expect. The website listed supplies in the cabin—mattresses, cookware, utensils, etc…, but without the chance to see any of it, we wanted to bring in our own gear just in case. Did cookware mean a full set of pots and pans? Or did it mean a couple of dinged up backpacking pots from the 1970s? I have absolute faith in the volunteers that keep the trails and cabins maintained, but everything costs money, and the cost of the cabin is so low we wanted to be prepared for anything. 5/5 – Depending on your expectations. We chose this based on accessibility, and it was perfect for us on this trip. It is less a quarter mile from the parking area, and the trail in is a fire road. There’s a mild grade downhill on the way in, and a bit rocky heading off the fire road up to the cabin, but we took our collapsible radio flyer wagon and had no issues getting in and out with it. You cannot drive up to the cabin, but I suspect if that is what you are looking for you are probably looking for a campground rather than one of these cabins anyway. But it is an easy walk, so if you are looking for a the cabin as a payoff after a good day hike, there are a lot of other cabins in the PATC network with longer hike-ins. Diningware: Utensils, plates, bowls, mugs, glasses. The only downside to this is that it’s all breakable, which I don’t recommend with small children, but for adults or older kids, there would be no reason to pack in your own diningware. Bedding: EXTREMELY comfortable mattress pads, and heavy wool army blankets. You’ll need pillows and probably your own sleeping bag, but definitely no need for sleeping pads. Firewood: We had plenty of firewood. The PATC asks that each guest leave at least as much cut wood for the next guests as they found, and there are hacksaws, a sawhorse, and wood splitters provided to do this. And in early spring there’s no shortage of felled wood. Even while keeping track of the kids we had no issue replenishing the wood supply without having to go far. Also of note: there is a woodburning stove INSIDE the cabin. I was a little unclear on this before we booked it, and it made the April nights much nicer to be able to bank some coals and have a little extra heat during the night. Water: There is a spring about 80 yards away from the cabin where you can collect water. We did not use this; since we had our wagon we packed in plenty of water, and we replenished at Lewis Mountain Campground which is about 2 miles away on Skyline Drive, since we did not bring a purifier of any kind. However several hikers we spoke with said the spring was flowing nicely. 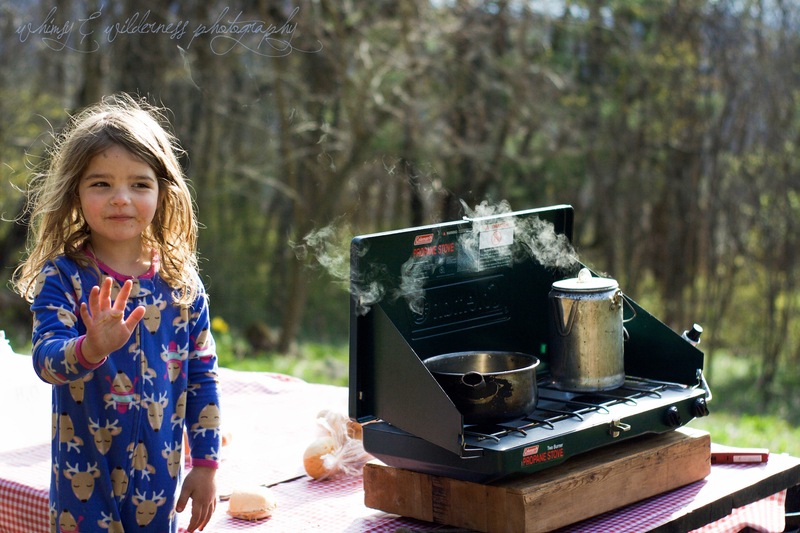 We brought our camp stove and I’m glad we did, as we still used that a lot. I’ve gotten spoiled with car camping and being able to rely on propane for a lot of our cooking, and we planned our food around being able to use the stove. I would bring it back to this cabin since it’s close enough to make multiple trips/wheel things in, but if we went to one with a longer hike-in I would still want to bring a backpacking stove, if for no other reason than I like having coffee in morning a lot faster than the time it takes to get a fire going hot enough to make it over the flames. 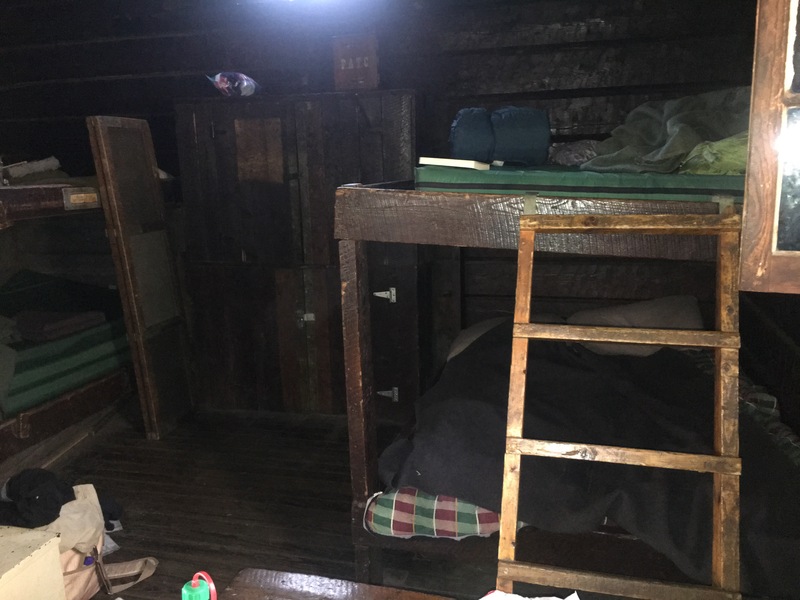 5/5: I feel weird even mentioning this about a primitive cabin, but I was so impressed by how clean and well-maintained the place was that I want to point it out. Even the privy was nice and clean, and as we were getting ready to leave the regional manager of the PATC showed up to pour a bunch of water into it, to soften it up before they drained it later in the week, so we apparently saw it at its worst. There are brooms and a few cleaning chemicals on hand to clean the inside of the cabin, and the occupants before us had done a great job before they left. And since I guess it fits best into this category: there are mice. They will eat your food. There’s a nice steel box inside the cabin provided to store food that kept them out, but we completely forgot about something we had in the baby backpack—fortunately it was nothing we were sad to lose, but we do now have a small hole in one of the mesh side pockets. But it was our fault for forgetting about it, and the cabin is sealed enough that I don’t think any other wildlife could get in overnight. That cabinet houses the plates/bowls/glasses, and the little box on top has the cabin library in it. As you can see the bunks are pretty wide and the mattress pads cover the width of them. 3/5: This also depends on your expectations. I was expecting to see hikers during the day, having done the Pocosin Mission trail before and knowing it wound around the cabin, however the AT run immediately behind it, and because of the spring, we were kind of a hot spot—a group of four actually took a snack break right on our front porch. A couple of birdwatchers we saw our second night there told us there were some thru-hikers camping close to us, though we did not hear them at night. You can also see a lot of lights from the various towns below the mountain at night—this is not a drawback for me, but if you want a complete feeling of isolation you won’t get it here. However, it’s still FAR more private than a campground, and there is no light pollution from other people’s lanterns or bathhouse lighting, and you can’t hear any vehicle traffic, even with the proximity to Skyline Drive. 5/5: Overall, the cabin was super kid-friendly. Probably more than a campsite since without other campers right next door I didn’t have to worry as much about how much noise they were making. It was easy to keep anything we didn’t want them playing with out of reach, and there’s a decent area around the cabin for them to explore. I did see poison ivy, but that’s to be expected on any outdoor adventure, and Kairi at least seems to have inherited my immunity to it (I didn’t learn to recognize the stuff until I had kids because I one of the lucky few who is not allergic). Both of them tripped over the rocks a lot but that had more to do with their ages. 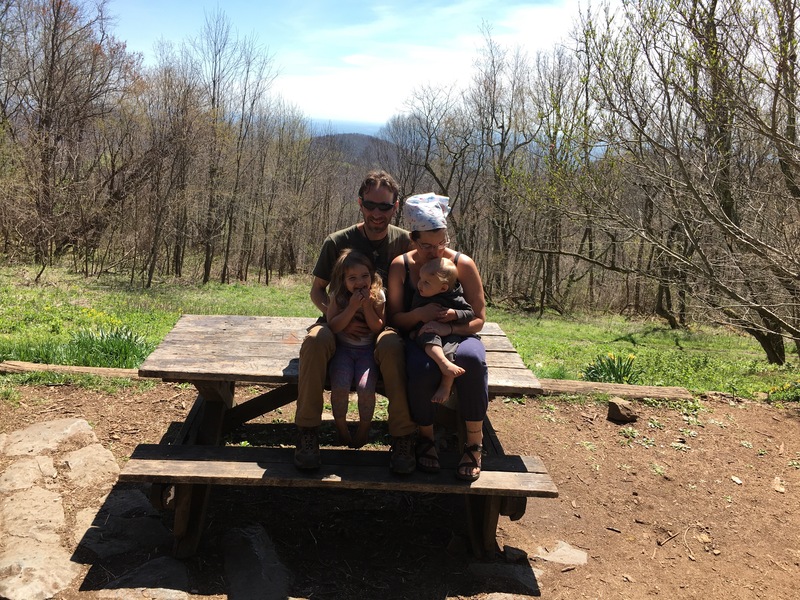 I give it a 5/5 rating based on my own kids, their previous outdoor experiences, and our own expectations about what might be challenging—Sebastian had a tick on him when we got home, and the PATC volunteer told us there are often snakes in the tall grass in front of the cabin. But again, we didn’t go to a primitive cabin we had to walk a quarter of a mile to get to without the understanding that we’d see bugs and get dirty and would have to keep a 12 month old from trying to climb on everything he saw. Overall I spent a lot less time chasing him away from danger than I expected to, and that nets a 5/5 rating for me. I would love to see this view in autumn! Would we go back? Absolutely. Billy was already trying to work out when a good weekend would be before we left, and Kairi spent a decent part of the day sullen and weepy because she “didn’t want to leave the cabin.” I don’t know if our next trip will be to this one—the PATC manager we spoke with recommended Range View as a good one to go to with kids since it has a lot of open meadow for them to run around in. I also really want to go to the Doyles River cabin one day, but since the hike-in to that one includes about 2/10 of a mile up a very steep grade, we’ll wait on that one until the kids are old enough to walk up it themselves, and can carry some of their own gear—that’s not one I would want to make multiple trips on! *A lot of cell phone pictures here, since I had my camera out of reach of the kids a lot of the time.